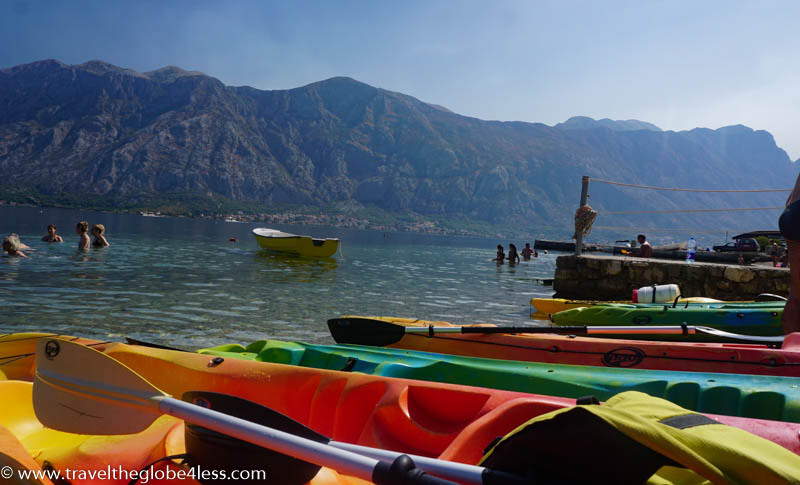 The bay of Kotor is possibly one of the most dramatic and perfect destinations for sea kayaking. Jagged peaks rise steeply from the inky bay to over 1,000 metres providing jaw dropping views, and the sheltered bay means waves rarely threaten your comfort. It’s perfect for beginners and the more experienced alike. If you want to spend a morning or afternoon soaking up the views from sea level, and escaping the crowds, take to the water and go kayaking in Kotor. We joined a tour with Adventure Montenegro. They also offer other activities such as hiking, rafting and climbing in and around the country. Look out for their bright orange and yellow kayaks, stacked by one of the honey coloured villas by the roadside, in the tiny hamlet of Muo. For €28 you can enjoy three hours of guided kayaking, or for €25 you can hire a kayak for the day and amble at your own pace. Paddle from bar to bar, beach to beach or take in some of the sights further afield. As you peer into the inky black waters, your eyes gradually adjust to reveal unpolluted waters, home to harmless brown jellyfish, dolphins, the occasional turtles and plentiful, small clams. We opt for the guided tour with Toni, the owner’s son. He speaks fantastic English and has a wicked sense of humour. He and his colleagues help us into our kayak and we settle back to admire the stunning views and feel the refreshing water lapping against our feet as they dangle lazily over the kayak. Before long, Toni beckons you closer, with the promise of a storytale. He points out a beautiful, crumbling villa on the bank, and recounts the legend of three sisters who lived there many moons ago. All three tragically fell in love with the same sailor who set sail one day never to be seen again. So heartbroken were the sisters, that each sat by their bedroom window awaiting his return. Years passed and though they expectantly scoured the faces of every arrival, disappointment followed disappointment. Eventually death came knocking and one sister passed on, her window shutters closed for ever more. The second sister followed suit, until only one sister survived, her windows open, eyes staring desperately out to the watery canyon. Alas, when she too passed on, there was no one to close her window, only a gust of wind or her lingering ghost…. I am unsure whether this is a fairytale or an embellished story of yesteryear, but nevertheless Toni weaves his tale to an enraptured group. Then, a splash of a paddle and we are moving again. We continue around the headland and Toni invites us to join him for a game of kayak polo. Of course, it is easy for him to manoeuvre as he wedges his kayak into the goalposts and perches on top. He makes light work of swatting away our pitiful attempts at goal. We look like clumsy oafs as we try to harpoon the ball, turn the kayak and aim the ball into the net simultaneously. A few balls eventually make it past Toni to hoots and hollers from our small group, but I don’t think any of us will be attracting the eye of an Olympic association. We continue paddling calmly up the fjord like bay, stopping to snorkel and swim on a small pebbly beach. Here tourists trade stories and admire the drama of the bay. My only minor complaint about this trip, is that I felt we stayed a little too long on the beach which is easily accessible by road. I would have preferred to paddle longer, but recognise that some guests might find the paddling tiring and may welcome the lengthy interlude. The rest did however allow plenty of time for photos of the magnificent scenery. Back on the water everything takes on a Venetian style elegance. Boutique hotels nestle shoulder to shoulder with crumbling buildings and palaces, a vestige of their former beauty, stolen by the 1979 earthquake. We chat occasionally with Toni, but for the most part enjoy simply floating and paddling through the calm waters. Kotor Bay is one of the most stunning inlets I’ve visited, and seeing it from a kayak is divine. We toured with Adventure Montenegro who you can contact via the website. Simply fill out details of your requirements and they will be in touch. The tour starts from the tiny quayside in Muo and is easy to find. Turn up, hop onboard and pay afterwards. Be sure to bring water, sunscreen and a camera. All your belongings are securely contained within a giant waterproof barrel strapped to the back of your kayak. Even if you capsize (highly unlikely) this baby is floating and will also double as a flotation device for those lacking in confidence. You can opt for single or double kayaks and whilst Jason and I are competent paddlers, I prefer a double as it means I get to do half the work and enjoy the views. Lazing back in the kayak, feet dangling in cool refreshing water, revelling in Mother Nature….what could possibly be better? Disclaimer: we paddled courtesy of Adventure Montenegro however all views are our own and totally unbiased. I would not hesitate to recommend this excursion as our guide was knowledgeable, spoke excellent English and had a friendly, affable way with all the guests. He also made a point to ensure he spoke to everyone throughout the excursion so solo travellers would feel welcome on this trip. Next Is It Worthwhile To Buy AVIOS With A 50% Bonus In September 2017? Kotor Bay is definitely a revelation of sorts. A lovely place as yet unspoilt by the trappings of commercialization. Kayaking sounds like an excitine and great way to experience the beauty of the land. The boats looks so colorful and I am sure the paddling makes for a romantic experience. 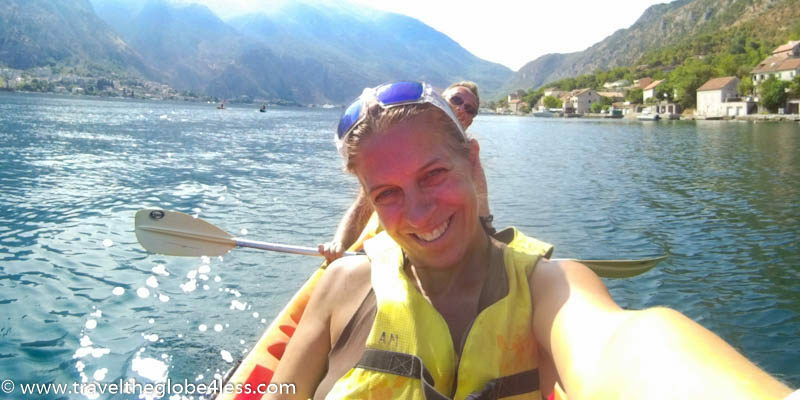 Adventure Montenegro sound great – I’ve been wanting to visit Kotor for a while, after having seen photos and been amazed by the spectacular beauty of the bay, but totally didn’t realize you could take kayaks out – very cool! I would probably hire a kayak for the day to go at my own pace, though I love that they offer both options, for a guided tour if you want to. Of course the benefits of a tour would be inside knowledge into local legends, and someone to play polo with!! Toni sounds awesome – maybe I’ll think about a guided tour after all! I absolutely loved Kotor! I didn’t know about this Kayaking though but it is one of the most amazing places I have been to. I would have loved to have done this. Thanks for sharing your thoughts with us. I did kayak once but i don’t remember too much, a long time ago!! I will do it again for sure as soon as I have the chance….Montegro never in my list….we’ll see! You made me laugh when you mentioned Toni inviting you all to a game of kaiak polo, some of the tour operators in my neck of the woods have amazing talents that you just know they’ve been doing since they were kids. Unfair advantage I say! This tour sounded like it was created for everyone, with plenty (maybe too much) time on the beach and kaiak. Magnificent views and images. Glad to come across a post on Montenegro! Somehow I feel this place is undermarketed or underpublished in mainstream media! Though your write up and pics will help change that! Thanks! 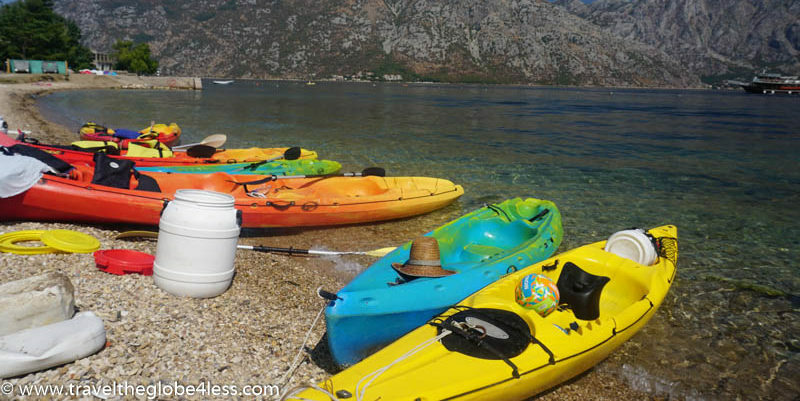 I love kayaking, and Montenegro is definitely on my list of places to visit. I’m actually considering going there in November. I wonder if it’s a good time to visit? Or too cold already? OMG, if you are considering it, you should definitely make it a priority. It is so beautiful there!